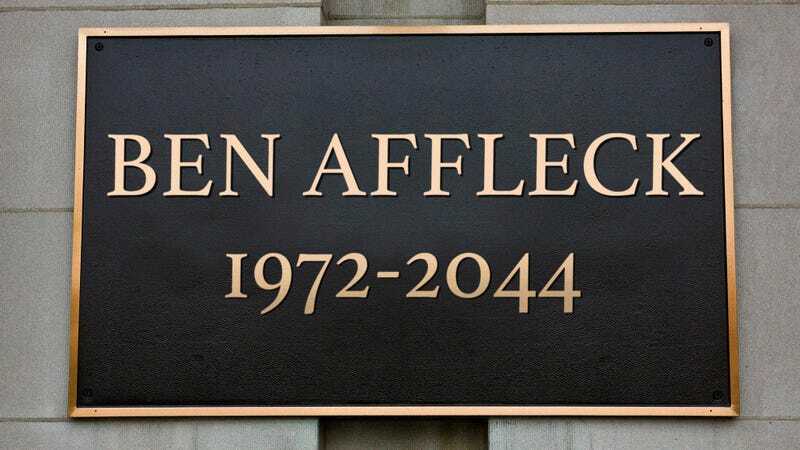 BOSTON—With hundreds gathered in the street upon which the actor and filmmaker will collapse and never recover on a warm July night in 2044, city officials in Boston unveiled a new plaque Tuesday that marks the location where Ben Affleck is going to die. “As I look into this crowd, I see people who, in 25 years, five months, and 24 days, will be devastated upon learning their hometown hero’s body was found cold and lifeless right here on Quincy Street between Baker and Ceylon,” said Mayor Marty Walsh during an hour-long tribute to Affleck, acknowledging the Cambridge, MA native’s contributions to the world of entertainment, including Good Will Hunting, Argo, an additional 19 upcoming feature films, and a memoir titled The Gambler’s Son that will hit shelves in January 2038. “Ben Affleck will forever be an inspiration to this city, even after heart disease takes his life at the age of 72. He has always done Boston proud, and I know he will continue to do so right up to the moment when he clutches his chest, falls to the pavement, and draws his final breath on this very spot. Now, to assist in the ribbon-cutting, I call upon brother Casey and lifelong friend Matt Damon, both of whom grew up with Ben and will hold his hand while waiting for Boston PD to arrive and pronounce him dead at 9:14 p.m. on that fateful night.” At press time, sources confirmed the ceremony had attracted a horde of protestors upset by the dozens of sexual assault allegations against Affleck that will surface later in 2019.